The Bradford born actor is well known for his many Theatre and TV credits including of course the Victoria Wood comedies Acorn Antiques and Dinnerladies. Duncan is currently on our screens as ‘Doug Potts’ in ITV’s Emmerdale. For the first time we welcome dancers from Deana Morgan Academy and Marc Otway and Abi Uttley who form ISSIMO are looking forward to taking part in the Bradford Festival of Remembrance again, for the second time, after supporting it in 2013. The event will end with a Parade of Standards, community singing and a Service of Remembrance. 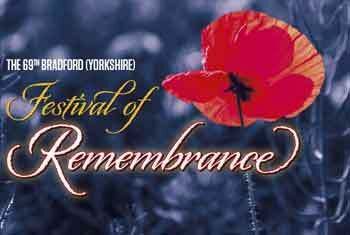 Be part of something special and join your community for the 69th annual Bradford Festival of Remembrance.